On a daily basis at Wild Birds Unlimited in Grosse Pointe Woods, we hear about the abilities of squirrels to successfully turn bird feeders into squirrel feeders. Even though we advise customers as to the capabilities of squirrels, some insist that the squirrels won’t be able to climb the feeder pole they are purchasing. We smile knowingly when they are back within days to admit that the little rascals easily shimmied up the pole and are monopolizing the seed. Squirrels are members of the rodent family. The Latin word rodere means “to gnaw”, as we can see in the damage these critters cause to our new feeders. Did you know that squirrels gnaw in order to keep their teeth sharp and short? If they didn’t, their teeth would be an unruly length since they grow six inches per year. 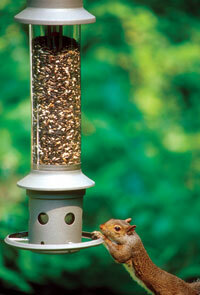 While squirrels can cause frustrating damage to feeders, this does not have to be the case. There are many strategies that you can employ to keep squirrels away from feeders. The acrobatic abilities of squirrels are legendary; at least here in Michigan. Pound for pound, Olympic gymnasts can’t compare. Since squirrels can jump up from the ground almost six feet and sideways a distance of eight feet, the location of a feeder within your yard is crucial to the success of feeding birds, not squirrels. A feeder hung from a branch would need to be placed eight feet from the trunk, forcing the squirrel to approach from above since the sideways approach would not work. The baffle that is placed above a feeder should be substantially wider than the feeder itself which is why it is difficult to keep squirrels out of wooden feeders hung from trees. At Wild Birds Unlimited in GPW, we find that the most successful baffle is one that was designed by an engineer who was fed up with the furry critters eating the seed he was offering the birds in his yard. The shape of the baffle forces the squirrel down and away from the feeder. Both wooden feeders and tube shaped feeders can be mounted or hung from poles. Many people report that they have greased the pole with a variety of substances including cooking oil, WD40, or Vaseline. While it can be entertaining to watch the squirrels slip down the pole, there are two problems with this approach. The first is that the substance needs to be reapplied as it wears off onto the squirrel. The second problem is that the matted fur of the squirrel causes its belly to be exposed to the elements, which can lead to hypothermia. On a pole-mounted system, the baffle needs to be placed five feet above the ground on the pole and preferably made of metal. Plastic baffles will end up becoming a way for squirrels to keep their teeth filed down, as previously mentioned. The pole system that the feeder is placed on should have eight feet of distance from any surface that the squirrel can leap from vertically, such as a deck rail, shrub, tree or another feeder system! If the pole system is under a tree or near a structure such as a garage, their jump from above will give them a further advantage. I’ve watched as a squirrel leveraged itself from the handle of a shovel that I had left upright in the ground, giving him the edge in making a successful leap. One of the strategies is to use a seed that squirrels do not prefer, which is safflower. The seed has a bitter taste and is not preferred by mammals, while songbirds enjoy its flavor. Cardinals, chickadees, house finches, Carolina wrens, and mourning doves all come to safflower. When you have a feeder that can be accessed by squirrels, such as a window feeder, safflower would be the perfect solution. Safflower is grown primarily for human consumption, as we use the oil from the seed for cooking. Therefore, the cost can be prohibitive for some budgets. However, when you aren’t feeding the squirrels, your seed last much longer and can be more economical. By far the best way to keep squirrels away from the bird seed is to use the feeder that has a counter weight, causing the seed ports to close off when a squirrel lands on the perch. The feeders of this type are made of metal so they are impervious to the gnawing efforts of squirrels. There are many excellently designed feeders that incorporate the counter weight system including the Eliminator, appropriately named. Whether you decide to baffle against them, buy feeders that exclude them, use Safflower seed or feed them their own feast, you have to admit that squirrels can be entertaining and their persistence is to be admired! Good Luck with making your bird feeders squirrel proof!